This entry was posted on November 23, 2014 by James_Hamilton. Perhaps, slowing global growth, including recession in Japan, and slowing growth in the E.U., Russia, and China, had some influence lowering oil prices. Or as Dean Baker points out this is roughly 2/3rds due to reduction in demand. – demand merely equals supply plus or minus inventory change, so by the exact same token, supply has fallen short of projections by practically the same amount. – the divergence from the 2007 projected demand/supply trend materialized mainly in 2008-2010, yet the price bounced back in 2011 and remained high through 1h14. Libyan production has increased at a 1.6 mbpd / year pace (750 kbpd in five months), which alone would be enough to meet global demand growth. North America added another 2 mbpd of production on top of this. As soon as the Saudis declared they were not cutting production, the implication was one of a global glut and a collapse in prices, and that’s just what we got. Regarding Saudi Arabia, I suspect that they have been waiting for a downturn in global demand that would allow them to maintain their production and net exports (especially during their low domestic demand winter season), as a way to drive down oil prices, which would hurt the high cost tight/shale producers. But an important point to remember is that the Saudis have so far been unable, or unwilling (take your pick), to exceed their 2005 annual net export rate of 9.1 mbpd (total petroleum liquids + other liquids, EIA). This post-2005 decline in net exports is in marked contrast to the large increase that they showed from 2002 to 2005, as their net exports increased from 7.1 mbpd in 2002 to 9.1 mbpd in 2005, as annual Brent crude oil prices rose from $25 in 2002 to $55 in 2005. Based on EIA data, their 2013 net exports were 8.7 mbpd (total petroleum liquids + other liquids). As annual Brent crude oil prices rose from $55 in 2005 to the $110 range for 2010 to 2013 inclusive, Saudi net oil exports have been below their 2005 annual rate for eight straight years. A second, and almost totally ignored, point is that CNE (Cumulative Net Exports) depletion marches on. By definition, it’s not whether Saudi Arabia has depleted their remaining volume of post-2005 CNE. It’s a question of by how much. 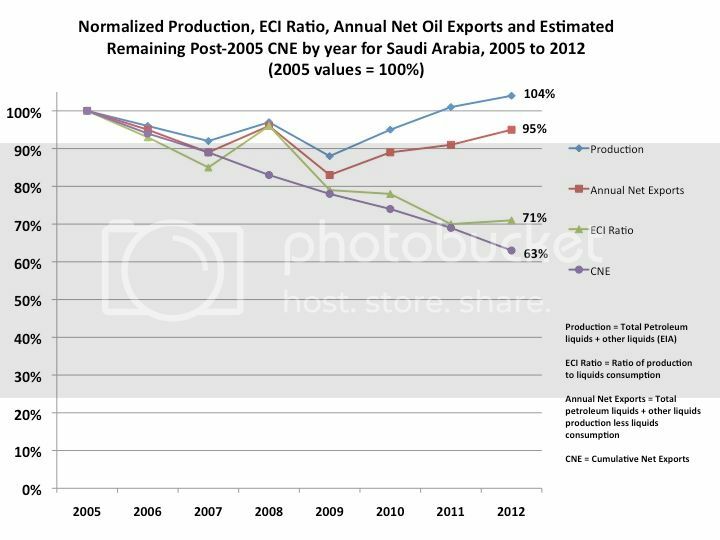 The following chart shows normalized values for Saudi production, net exports, ECI Ratio (ratio of production to consumption) and remaining estimated post-2005 CNE by year (with 2005 values = 100%). 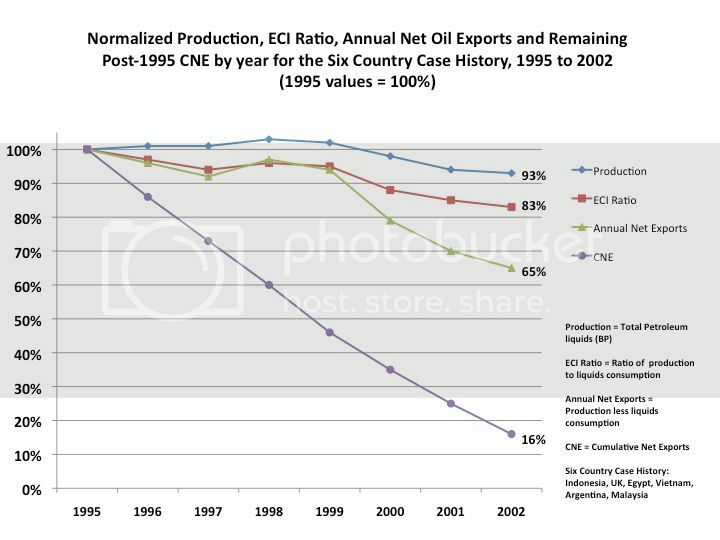 The estimate for post-2005 CNE is based on the rate of decline in the Saudi ECI Ratio (at an ECI Ratio of 1.0, net exports = zero). I estimate that in only seven years, through 2012, Saudi Arabia shipped roughly one-third of their post-2005 CNE. One other little interesting point is that the Six Country Case History showed an accelerating, year by year, rate of depletion in their post-1995 CNE, and I estimate that Saudi Arabia (and the 2005 Top 33 net exporters in genera) are showing similar accelerating rates of depletion in post-2005 CNE. The Six Country Case History, from 1995 to 1999, illustrates the profound difference between production and CNE depletion. But, the US only imports 20% of its consumption. Almost half of US oil imports are refined and exported. That doesn’t seem like a normal definition of dependent. One of the reasons that gas commands a premium price is that it is dispatchable. Power sources which can ramp up just when you need it, or deliver constant output when required, is inherently more valuable than power sources which are only available when the sun shines or wind blows. Until buffered solar/wind can compete on price with coal or gas then they act merely as cheap supplements as opposed to replacements. At the moment the cost of making up for wind/solar intermittency is borne by other producers, and in places like the UK that may show up in worsening grid stability. Solar and wind need to be much cheaper than natgas to compete with it commercially, as they are unpredictably intermittent whereas natgas is predictable and scalable. If solar and wind were forced to compete commercially they would be paid less than base power. There are not yet any truly commercial solar or wind plants anywhere. All rely on officially set, non-commercial tariffs. These statements are partially wrong: PV and wind are variable, however, they are within the constraints (hours to day-ahead) of a modern energy system predictable with high quality. The other aspect, you conveniently forget to mention, is that the price of electricity from wind or PV is known for 20 years, this allows long term PPAs, which in contrast are not possibel for NG, one aspect that explains the money investors pay for wind and PV. BTW: What is the cost of electricity generated by written off wind power or PV? Is it higher than coal power? Or from a more technical POV: You can combine the cheap wind and PV with NG turbines (“virtual power plants”) and get the best of both worlds. Wind and PV would deliver more than 60% of the energy, that without any storage. “partially wrong: PV and wind are variable, however, they are within the constraints (hours to day-ahead) of a modern energy system predictable with high quality.” – Perhaps your English isn’t clear enough, but if you’re saying wind and solar produce at times close enough to demand to be commercially valuable, that’s not true. They would have to produce exactly at the same time as demand to be commercially valuable. or grids would have to have commercially viable batteries. “you conveniently forget to mention, is that the price of electricity from wind or PV is known for 20 years, this allows long term PPAs, which in contrast are not possibel for NG, one aspect that explains the money investors pay for wind and PV.” – I didn’t get into that much detail but you are making my point: the only reason anybody is building solar or wind plants is that they receive state-mandated terms far better than they would receive if they had to negotiate commercially with distributors and customers. “Baseload price is determined by written off coal power plants or NPPS, to compare this with new wind/PV is comparing apples and oranges.” – Indeed, base load power is cheap, and if solar and wind had to negotiate their tariffs on commercial terms, they could not hope to be offered as much as base load, as they are not as reliable as base load and require frequent back up. In very sunny, nearly cloud-free locations with lots of AC demand, solar would get about the same as base power. “You can combine the cheap wind and PV with NG turbines (“virtual power plants”) and get the best of both worlds. Wind and PV would deliver more than 60% of the energy” -No, a commercial investor getting no subsidies or mandated high tariffs for solar or wind would never build that way. They would build a base load coal, natgas or hydro and a peak load natgas. Your model requires a far bigger expensive peak load natgas to not only adjust to demand but also adjust to the intermittency of solar and wind. You would reduce efficiency and relative to pure natgas probably increase the carbon footprint when considering the production of photovoltaics probably in China likely powered by lignite coal. but tom, don’t current power plants using coal basically get a subsidy for not paying for their pollutants? carbon emission are going to need to be cleaned today or tomorrow. right now we are pushing the bill off into the future, so i am not sure your argument that solar and wind only work with tariffs, etc is valid. right now solar and wind are actually paying a premium because they do not produce carbon. our market is currently backwards. @baffle – yes, that’s fair. so do solar and wind to some extent. as they aren’t pollutant or carbon free, they have to be produced, and that process is dirty. i’m all for leveling the playing field by making every kind of energy fully pay its true costs, and that includes a carbon tax. but the rush to build solar and wind regardless of their efficiency is not helping reduce pollution or carbon. the focus for now should be on improving efficiency of natgas and coal. by focusing so heavily on solar and wind, the environmentalist movement gets nothing useful done while primitive coal-burning is still proliferating. solar needs further research, it’s not ready for the market. wind might be worth further research but looks to me like a faddish dead end that will turn into regretted eyesores. Their prodcution is predcitable, therefore, you have time to fire-up fossil back up capacity. Netintegartion is quite cheap for RE levels around 40%. Sorry, new coal or NG capacity also need support, that is actually the problem. Your argument only works as you compare the costs of written off coal power plants with new PV and wind. Neither in Germany nor the USA NEW caol is cheaper than onshore wind. That is wrong. They do not build new coal power because onshore wind is cheaper and destroys full load hours, i.e. the economic base of these plants. Customers buy first the chaep wind power. As long as onshore wind is the cheapest solution coal and nuclaer power are in trouble. You have no argument that the combination of NEW wind/PV plus NG open turbines can not be chaeper than NEW coal power. Yes, but peak load runs with low FLH, open NG turbines do the job. If I need 10 GW secure power I would build e.g. 20 GW wind, 10 GW PV and 10 GW NG, as long as the NG tubines run for less than 2000 hours, the costs of these virtual power plants are low in comparison to alternatives like NPPs or hard coal in Germany. Add externalities and coal is dead. Coal and nuclear are made artificially more expensive through excessive regulation. Reality is that solar and wind are not viable outside of modestly sized projects. Without effective storage, they push cost onto other dispatch-able producers. To reduce fossil fuel consumption for power, reducing the regulatory cost of nuclear is vital. Nuclear base with dispatch-able natgas and hydro where possible is where we need to be going. If reducing mercury and sulfur emissions are your idea of excessive regulation, I’m afraid we disagree. And, do you agree with all of the leading scientific and engineering societies that CO2 emissions are a serious cost? In the US, we mostly pay producers for their “firm” power capacity. Wind and solar gets some credit for helping provide peak power capacity, but fossil fuel & nuclear producers get paid for what their higher levels. New coal still can’t compete, and gas is starting to have some trouble. Nuclear, of course, is in serious trouble. Interesting that the U.S. now imports more oil/petroleum products from Canada than all of OPEC combined. http://www.eia.gov/dnav/pet/pet_move_impcus_a2_nus_ep00_im0_mbbl_m.htm That might increase if Keystone were built. Meanwhile, shale production in the U.S. continues to move forward. Apparently, the sky is not falling except maybe for OPEC. I’m fearful too many highly leveraged business models are supported only by $80+ oil. Banks, private equity investors, and private lenders will experience big losses if low oil prices continue. Sometimes, declining commodity prices can create weakness that has systemic consequences. The Telegraph has an article, linked below, quoting Daniel Yergin as saying that “We will have lower prices for some time to come.” Following are some links to some similar articles, from 15 years ago and 10 years ago respectively. Yergin’s prediction, 10 years ago, that we were destined to see a long term oil price of about $38 per barrel caused me to suggest that we price oil in “Yergins,” with One Yergin = $38. Brent is currently trading at a little over two Yergins. Consumers everywhere will rejoice at the prospect of cheap, plentiful oil for the foreseeable future. Policymakers who remember the pain of responding to oil shocks in 1973 and in 1979-80 will also be pleased. But the oilmen’s musings will not be popular with their fellows. For if oil prices remain around $10, every oil firm will have to slash its exploration budget. Few investments outside the Middle East will any longer make sense. Cheap oil will also mean that most oil-producing countries, many of them run by benighted governments that are already flirting with financial collapse, are likely to see their economies deteriorate further. And it might also encourage more emissions of carbon dioxide at just the moment when the world is trying to do something about global warming. Yet here is a thought: $10 might actually be too optimistic. We may be heading for $5. To see why, consider chart 1.Thanks to new technology and productivity gains, you might expect the price of oil, like that of most other commodities, to fall slowly over the years. Judging by the oil market in the pre-OPEC era, a “normal” market price might now be in the $5-10 range. Factor in the current slow growth of the world economy and the normal price drops to the bottom of that range. Energy is one of the two leading risks in the global economy. (Terrorism, of course, is the other.) Just take a look at one industry already suffering from oil shock–U.S.-based airlines will lose $5 billion this year. That loss matches the bump in fuel prices. Ouch. Then there’s China, which has climbed to the world’s number two spot in oil consumption. China uses most of its oil wildly inefficiently to generate electricity. Oil consumption by cars barely registers–now. But during the next four years, China’s oil imports will double as the Chinese give up their bicycles. Biting your nails yet? Here’s one more sobering oil fact: The world has only a 1% short-term cushion. This makes for a very volatile market. Given these facts, where will oil prices be a year from now–$75 a barrel? $100? Wrong numbers, says Daniel Yergin. Wrong direction, too. Try $38. Yergin knows oil. He is a founder and the chairman of Cambridge Energy Research Associates, a consultancy that has 230 employees, with offices worldwide. He is also a recipient of the United States Energy Award and a member of the Secretary of Energy’s Advisory Board. A former Harvard professor, Yergin is best known for his Pulitzer Prize-winning book on oil, The Prize: The Epic Quest for Oil, Money and Power. Yergin’s prediction of cheaper oil prices is noteworthy because he doesn’t dispute any of the alarming facts cited in my opening paragraph. Not that he would. The facts came straight from Yergin’s own mouth at the recent Forbes Global CEO Conference in Hong Kong. I jotted down Yergin’s comments while listening to him speak at a dinner. Then he gave a formal speech the next morning and, fueled this time by highly caffeinated tea, I again took notes, just to be sure. Yergin is pretty clear about his predictions. He says oil demand will rise, yet prices will drop. How can this be? Answer: capitalism’s amazing resiliency. Oil prices rise–oilmen become innovative. They work, they invest, they put their heads to the task, they apply technology, and pretty soon they’ll discover how to extract oil profitably from oil sand. Or open wells in deeper water. Or scour the planet for new sources using scanners thousands of miles in space. As Yergin reminds us, oil output is 60% higher today than it was in the 1970s. Not many sages from the 1970s would have bet their reputations on this development. The opposite sentiment prevailed back then; experts said the planet was running out of oil. Wrong. Yergin says he’s always asked when oil will run out for good. He shrugs. He’s willing to say the world will need 40% more oil in 2025. Hard work and technology probably will find a way to meet the demand. . . . . Whatever action Opec takes on November 27, it is clear that its once staggering power over the global economy has been considerably weakened as a new era of lower oil prices beckons. In reality, it’s very likely that actual global crude oil production, generally defined as 45 or lower API gravity crude oil, virtually stopped increasing in 2005. Global liquids production, consisting of crude oil + condensate + natural gas liquids (NGL) + biofuels, has so far continued to increase. Condensate (basically natural gasoline) and NGL are byproducts of natural gas production. Actual global crude oil production probably effectively peaked in 2005, but global natural gas production and associated liquids–condensate and NGL–have so far continued to increase. Note that when we ask for the price of oil, we get the price of 45 or lower API gravity crude oil, but when we ask for the volume of oil, we get some combination of crude oil + condensate + NGL + biofuels. Shouldn’t the price of an item directly relate to the volume of that item, not to the volume of the item plus partial substitutes? For more info, you can search for: Did global crude oil production actually peak in 2005? When we calculate Global Net Exports of oil (GNE), we have to deal with total petroleum liquids + other liquids (EIA data base). I define GNE as the combined net exports from the top 33 net oil exporters in 2005. The EIA shows that GNE have been below the 2005 rate of 46 mbpd (million barrels per day) for 8 straight years, with GNE in 2013 falling to 43 mbpd. While falling US liquids consumption (relative to 2005, but currently rebounding) and rising US oil production have lessened the demand for GNE (and had an effect on global crude oil prices), by definition, this had no (direct) impact on the supply of GNE, and the most recent EIA data show that the US is reliant on net crude oil imports for 43% of the crude oil processed daily in US refineries. And while we have recently seen some signs of softening demand in China, the volume of Global Net Exports of oil available to importers other than China & India fell from 41 mbpd in 2005 to 34 mbpd in 2013. For more info, you can search for: Export Capacity Index (ECI). Time to revisit My conclusion is that hundred-dollar oil is here to stay, Professor. We’ll see how things turn out, but I am far from convinced that the marginal cost of oil to supply the global oil system anything near $80. I think $100 still looks like a good number to me over the longer term. I should have some more specific numbers on this is a couple of days. Ouch, that’s embarrassing (but not only for James). James, did not I tell you that the oil price is not only related to supply and demand ? Higher demand – prices are sinking ? Any ideas ? A number of the forecasting agencies see supply running as much as 1.5 mbpd ahead of demand currently. If OPEC doesn’t cut production, then we could see significantly lower oil prices for the next several months. You are once again free to move around the country. For a while, at least. Or, buy a Volt or Tesla (depending on your price range), and never worry about gas prices again. My personal view is that we’ll see a bigger response in conventional production than shale oil. Yes, lower oil prices will boast consumption and the economy. But I would not get carried away with that line of thought. As of Sept, 2014, energy as a share of nominal personal consumption expenditures (PCE) had already fallen to 5.15%. That is about midway between the low of 4% in 1999 and the recent peak of 6.8% in2008. From 1981 to the 199 lenergy’s share of nominal spending fell from 9% to 4% of PCE. But in 1999 WTI fell to under $12/bbl and retail gasoline prices were under $1.00 /gal. Interestingly, the main beneficiary of lower oil prices is usually the auto sector. Autos and energy as a share of PCE is very close to a constant, meaning that a one percentage point drop in energy’s hare should lead to a one percentage point rise in auto’s share. We are already seeing sales of small fuel efficient autos falling in favor of larger cars and light trucks. For over two years I have taken the position that there was a fairly solid floor under WTI at under $80 because at that point the marginal production of fracked oil becomes unprofitable. If this is right, in contrast to US history, part of the stimulus of low oil prices will be offset by damage to the domestic oil industry. Historically the US exported that damage to OPEC countries. Of course, I remember all the “see through” buildings in Houston in the 1980s. If you look at what’s improved most in the US year over year, it’s oil, oil refining and SUVs. Not quite the traction Obama was hoping for. I would expect only a small boost to growth rates from lower oil and gasoline prices. There will be some boost to consumption and domestic production of consumer goods and services, but not much help for exports, some boost in imports in real terms, and a deceleration of oil production growth. And meanwhile investment growth is slowing as overall the economy seems to be reaching mid-cycle. I’m not especially pessimistic but I would have kept the neutral face. Does anyone have data on Libyan export of oil? I keep seeing figures for production (increasing! they say) but nothing about how much of it leaves the country. 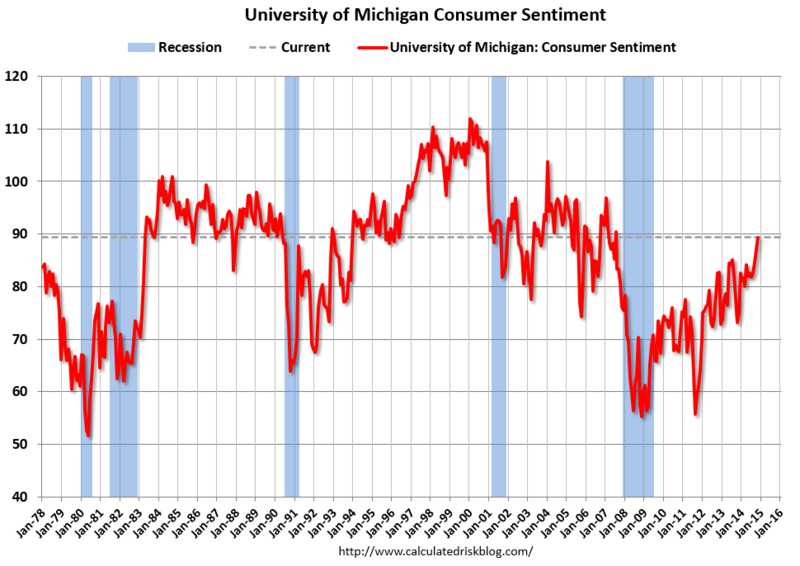 Lower prices lead to better consumer sentiment. Shoppers love deflation.